Is the iPad Mini 4 a worthy upgrade to the Mini 1, 2 or 3? It was a week before the announcement of the new Apple products in September 2015. I had placed a bid on the iPad Mini 2 on eBay and I was prepared to go to £200. Then I read on Facebook that Apple were having a huge announcement on their new releases and my heart sank. I didn't want to win that iPad Mini 2 any more. I am now flying the DJI Inspire 1 as part of my work and my Samsung Galaxy S4 (smartphone) and Galaxy Note 10.1 (2014 edition) tablet kept playing up during flights. They would lose signal and the app would crash completely at the most inappropriate moment. This meant I had to fly home "blind". A friend with another Inspire 1 was using the iPad Mini 2 with no problems. Cool, I'll get one of those hence the bid. So then the announcements came from Apple. I was pleased that someone had outbid me on the Mini 2 which finally sold for around £220. This was a ball-buster for whoever bought it. Because the very next day, Apple reduced the price of a brand new iPad Mini 2 to just £219 for the 16gb version. They also, all be it very gingerly, announced the iPad Mini 4. It was a very subtle announcement as they didn't want to detract from the new iPad Pro or iPhone 6s series. However, it was a significant upgrade to many people. The iPad Mini 4 is now 18% thinner (now 6.1mm) and weighs 299 grams. I must admit it feels good in the hand and I can just about manage to hold it side-to-side in one hand. Whereas the Samsung Galaxy Note 10.1 is way too big for that. The iPad Mini 4 also feels solid and durable…built to last. It also has a new and better display that has eliminated the gaps between 3 separate layers in the past. They are now built into one, strong display with less reflecting, more lifelike colours, greater contrast and sharper images. The display is very bright which is exactly what I need when flying my Inspire 1 outside on a sunny day although I would still have liked it a little brighter. I think for most people sitting outside and reading or playing games, the screen brightness will be more than enough. I have only ever owned the iPod Touch 4 and iPhone 4s. However, I have to say I was always impressed with how smooth the screens were and how responsive the workings were. I never had a problem with them. The iPad Mini 4 has a 30% faster CPU and 60% faster graphics than it's predecessor and it's pretty fast. I noticed this when flying the Inspire and how quick the screen reacted to my inputs. The live feed from the Inspire 1 looked impressive on the iPad Mini 4 retina screen. It was only hindered by the slight delay from the Lightbridge video feed on the Inspire. All in all, having played with all the included apps on the Mini 4, I am impressed with the speed, fluidity and responsiveness of the new iPad. Even though I won't be using it much (I really don't like the look of someone taking photos with iPads. iPhone's or smartphones, fine, but not a bloody great iPad. I was keen to see how the camera fared. To be honest the specs on the camera were a bit "meh" for me. Then again, I don't really want a high spec camera on something this big. In saying that though, the camera is pretty good for a tablet, as is the software that comes with it. I had a blast with the kids using Photo Booth! Once you have taken your photos or video clips, you can edit and share to your heart's content using the supplied software. "Adjust exposure, colour, brightness and contrast. Add filters. Edit a movie with iMovie. Or use third-party apps to get even more creative. For example, turn a photo into a cartoon, complete with dialogue balloons"
The front-facing FaceTime HD camera is also pretty cool. 1.2mp, f2.2, 720p video, dual microphones. All you need for FaceTime calls really and of course, with all the cool apps available, you can use either camera for all manner of fun including improving your golf swing or scanning documents. To be honest, I can't see myself ever using this as a camera. Maybe that is because I am a professional photographer and have a multitude of pro camera gear. But, if it was all I had, it would easily suffice for family snapshots etc. Overall, I wasn't impressed with the image quality but what do you expect from a tablet? iPhone's and other Smartphones produce way better images so stick with those. The video quality using the built in app on the iPad Mini 4 is ok for general use. In all honesty, you are better off using your Smartphone if you haven't got a decent video camera with you. Using the built in camera app, you have no control over any video settings whatsoever other than changing the resolution to 720p from 1080p. Here is a very quick and rough clip (straight out of camera) from the beach handheld using the built in app. However, I have installed the superb and award-winning Filmic Pro app to the iPad Mini 4 and it makes a huge difference. My iPad has now become a fully-fledged video camera and I can change just about any setting I want. I can even film in 3k!!! The video below (straight out of camera) was shot quickly at 3k (although downsized for Vimeo to 1080p). It was using a higher bit rate of 50Mbps giving much clearer footage. Check both videos out at full screen to see the difference in image quality. Pretty cool. Filmic Pro is $9.99 but well worth it if you plan on doing a lot of video work with your iPad Mini 4 or other Apple device. I haven't been around Apple since IOS 7 but IOS 9 is very slick I must say. The screen lock button on the side of previous iPad Minis has been moved to a digitized button within IOS 9 as has the mute button for sound. Not really a problem for me and it just means a slicker design on the outside I guess. Some people may miss the physical button though. This is something people will find very useful but to be honest, I have been using this for a couple of years with Android. This will basically allow you to swipe from left to right bringing up a raft of apps that you can use in 1/3rd of the screen's real estate and then swipe away when finished. It won't allow you to use both apps at the same time though. For that you will need the split screen function below. Slide over is good for answering a message or quickly looking something up in Safari or other browser whilst you are working on another app such as email or messaging. To activate this couldn’t be simpler. When you have used the slide over feature mentioned above to activate a second app, you simply press the centre of the divide and that will lock both screens in place. You can then adjust the split ration to whatever you like. This will then allow you to use both screens at the same time which is super-useful. This is probably my favourite feature. When you are watching a video or on a FaceTime call, you can press the home button to shrink the video and send it to a corner of the iPad. Even if you start using another app, the video will overlay and stay in place all the time. You need to activate this in settings. This is great for watching a movie while you work or researching stuff whilst on a FaceTime call. To be honest, I have had these features, and more, on both my Samsung Galaxy Note 10.1 (2014) and aging Samsung Galaxy S4 Smartphone for a while now. In fact, I can have up to 8 or 9 different apps open and running on the Note. Plus a video playing in the corner with no problem and very little lag. Nice to see Apple have finally caught up though. I had a lot of hassles with the Samsung's crashing the DJI Go App. After this, it was a pleasure to use the iPad Mini 4 when doing some recent aerial footage. The screen was bright, responsive and it never crashed, even on a 3-4km flight. I did notice that it lost signal once or twice when I was a fair distance away but it soon came back. I think it was more to do with Lightbridge on the Inspire than anything to do with the iPad Mini 4. The size of the iPad was perfect too. Using my Samsung Galaxy S4 Smartphone was ok but it was simply too small. The Galaxy Note 10.1 tablet was too big, it only just fit in the cradle and added a lot of weight. The iPad Mini 4 sits perfectly in between them both and the 7.9" screen was spot on! The biggest flaw when using the Android tablet was when I put it into landscape mode. The connector was at the bottom whilst in landscape mode. This meant I couldn't connect the tablet to the controller without shifting it along when securing. This worked but made the weight distribution unstable. I wasn't fussed about the fingerprint security on the iPad Mini 4. However, now I have used it for a week, it is actually pretty cool and a quick way of getting access to a locked device. Much easier and quicker than typing in a 4 or 6 digit number. Some of the apps are excellent and I can see "Garage Band" getting a lot of use. This was only ever meant to be a quick "head’s up" rather than a full review. Other than knowing about the increase in specs, there really isn't much more to say about the new iPad Mini 4 over its predecessor. Yes, it is faster, a touch smaller and so on. If you already have the iPad Mini 3 and don't need the extra power, I wouldn't bother upgrading. What I didn't realise however, is that a few cool 3rd party products have come on the scene to work with iPads and iPhone's due to Apple dragging their heels when it comes to accessories and add-ons. Anyway, even after being away from Apple for a few years, I wasn’t "wowed" by anything on this device as it is. It was almost like picking up an iPad or old iPhone from years ago. However, I still love the reliability of the iPad and the sheer beauty of the retina screen and display. I do feel "safe" with the iPad though as it's heritage stands the test of time. Unlike my Androids which tend to lag a little now and again or the apps crash completely. I guess there will never be a perfect tablet that ticks all the boxes for everyone but the iPad Mini 4 is nice. Very nice in fact and if you are buying your first tablet, you could do a lot worse. Me? I will still be using my Galaxy S4 as a phone (not ready to upgrade yet : ) and Galaxy Note 10.1 as a general email/Facebook/surfing tablet leaving the iPad Mini 4 purely for flying the Inspire 1…for now. 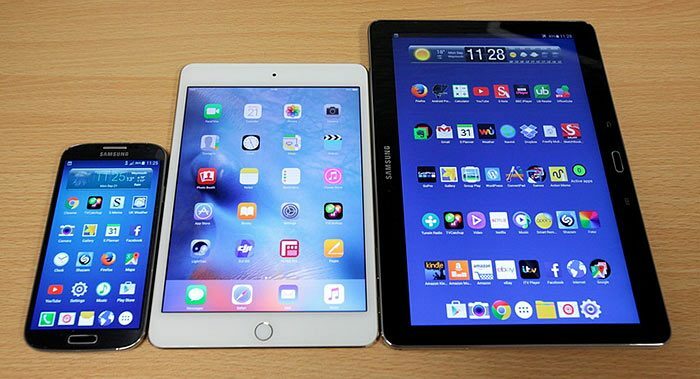 The iPad Mini 4 still doesn't quite match the specs of the Galaxy Note 10.1 and that is now two years old.